You know it’s not often when I agree with the kitties that live here. They were here before me and still seem to harbor resentment about my arrival, often smacking me in the woozle for no reason. But this time we are on the same side. While trying to sleep every night my mom person continually gets in the way. Moe likes to sleep on the outside of the bed & I like to sleep in the middle. The problem is my mom person’s legs & feet are limiting our space! This photo is not very good, because I had to force my mom person to take it with her cell phone. The things sticking up between Moe & I are my mom person’s legs. This happens every night, causing me to lose sleep and require extra naps during the day, which keeps me from patrolling my yard properly. Any suggestions on how to get my mom person to take up less of the bed are welcomed! MOL OSKAR It must be very hard to sleep with Cloe’s high beams and the Mom moving all over creation. I wish I had an answer. All I hear is Madi don’t sleep between my legs I cannot turn over you weigh a ton….yada yada yada!! My reply is if you would be still, find a good position and not move we’d all be happy. Well I get in the bed first. That way I pick the spot I want and that is that. But I have to say my MOM is very good at letting me have whatever room I want and she is all to happy to take what is left. Don’t laugh, but when I only had a twin bed and my dog Shadow – I’d let her take the bed. I slept on the floor. I know, I know. I broke every rule in the book. But it was just easier than fighting with her for space! Thankfully, I have a California King now and it isn’t an issue with Blueberry. OK, Oskar, Bites Here. Number one get on the bed FIRST lay down and make noises when everyone else gets in. Number two, make sure you have more then you need. Number three, if Mom moves away, quickly move with her, MMORE ROOM to argue with. Four, if you find your space is being invaded lay your head on a leg, then she will move it away, cause it went to sleep. Lol your mom sounds like me! Except I don’t share the bed with any cats. Just a 55 lb dog and a 10 month old baby. I’m sure Shiner would say the same things about my legs being in the way too. Although I think she does kind of like them there to sleep on top of. Ann Paws recently posted..Help! My Dog’s Been Skunked! OK, sorry to say it but if your mom person is going to insist on being selfish and hogging the bed then she must buy a bigger bed! she should just give YOU guys the bed! We have exactly the same problem – especially since Trixie’s been big enough to be picked up and brought into bed. With one puppy on each side, and Trixie liking to sleep as close to our human as possible (preferably on her head or across her throat), all we hear are complaints about not being able to move, or being too hot, or dreaming about being choked to death. Humans are such complainers! Have you considered being a bit firm with your Mom and insisting that she sleep on the floor? It’ll be difficult at first, but you do need your sleep, and she’ll be happier in the long run once she understands her place in the household order (the kitties, then you, then her). We haven’t needed to take such drastic measures yet, but we’re keeping it in mind as an option – particularly if we get more complaints about her not being able to breath with a puppy sleeping on her face. What a bed hogger your mum is, Oskar. Doesn’t she care about your comfort? Bad human! Georgia Little Pea recently posted..The huntsman, Alfred and a mystery plant. I don’t have a good answer Oskar, but I will sleep on it! We don’t have any suggestions — we think its too dangerous sleeping in the same bed with Mommy — she tosses and turns like crazy!!! We have our own little doggie beds on the floor — so we have to settle with that. Good thing we don’t have any cats at our place!!! Dougall recently posted..Who let the… pig… out? We gave up sleeping in the big bed with HER…SHE’s up and down all night and moving in between. We NEED our beauty sleep. How about a bigger bed? We have a king sized one and I’ve been told that there used to be three 70 lb. dogs and both my parents in it. Of course my mom is vertically challenged so she doesn’t take up much room. I think you should get into bed first and then start snooring real loud. Then kick like you are having a bad dream. Then toss and turn. I think all these things might help. One word Oskar…Dog Bed. Not for you, for your Moms!! I means, she’s takin’ up all the big bed space, it is three against one! How I wish I could LOL, but my throat still hurts. I’ll visit you more often when I’m no longer sick. 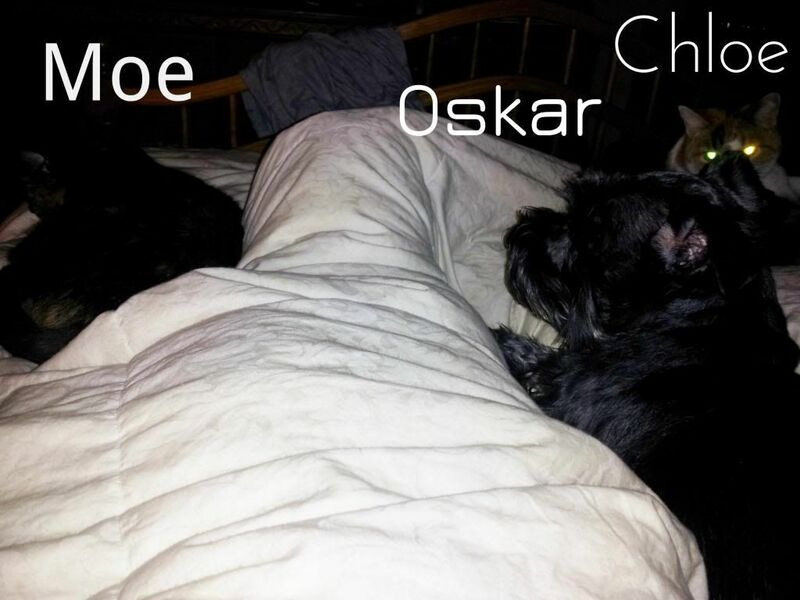 In the mean time, try to ask Chloe or Moe to make way for your royal highness Oskar. They smack you in the woozle? that’s just mean! There’s always a bed here pal if you want one!! It could be worse for her, you could sleep on her legs and use the blankie like a hammock. That’s what Scruffy likes to do. Plus you could also be under the covers, that’s what Mr. Fox likes to do. Or the kitty could come right up next to her face and purr incessantly until a sufficient amount of petting has been done even at 3am! We have solved that problem by ignoring the Mom and climbing on top of her to extend our maximum sppace! A bigger bed, or a new bed and you get the new one! !